Chiropractic works with the structure of the spine and pelvis and the function of the brain and nervous system. Restrictions in the spine can occur affecting normal spinal movement and function. Chiropractors identify these problems and look to the best available ways to improve the spinal function and achieve your health goals. On your first visit, your Thrive Chiropractor will discuss with you your health history, any concerns that you may have and what your health goals are. You will undergo a thorough physical examination, depending on what is indicated by your history and presentation. It may include posture, range of motion, reflexes, sensory testing, muscle function, balance, co-ordination, primitive/postural reflexes and others as necessary for your particular case. From this thorough examination, we can let you know if this is a Chiropractic issue or recommend another Thrive health professional to best help you on your journey to improved health. 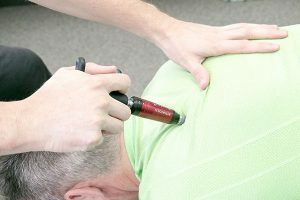 Chiropractic treatments at Thrive range from 30 minutes on extended treatments and 15 minutes on standard treatments, utilising multiple techniques to help you reach your goals.